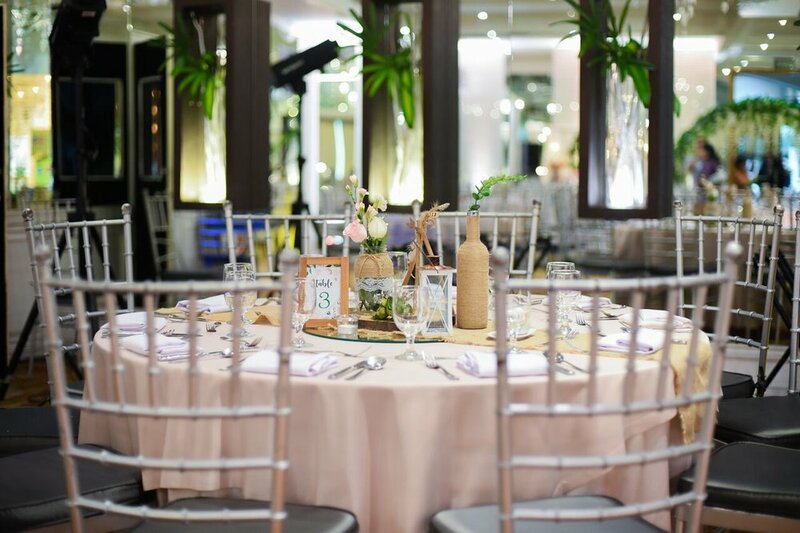 When Ms. Jeyme Azarraga-Morallo of One Tree South Events contacted me last month and expressed interest in holding a baby shower for Joey and me, I honestly didn’t think much of it. I just said yes, invited a few family and friends, coordinated on the date, theme, and registry, booked my hair and makeup artist, asked my stylist for an outfit, and blocked off the date. Both Joey and I thought it was just gonna be another event, another baby shower. The evening before September 2, our chosen date for the shower, Joey and I made our way to Vivere Hotel, Alabang. 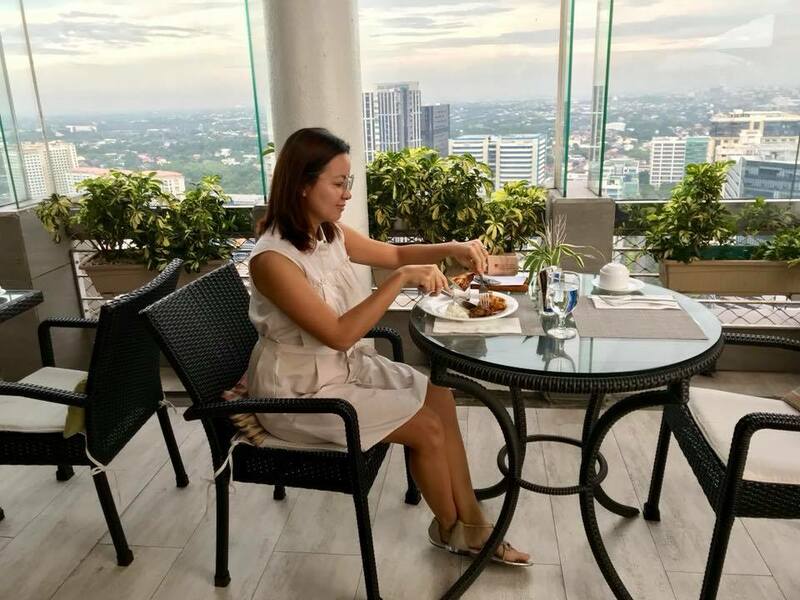 It was our first time to check-in there, though I do remember having dinner with my best friend Marj at their rooftop restaurant years back (today, the ambience still is a superb; the view still beautiful albeit obscured by some hedges). Again, we went there not expecting anything, just to get a good night’s rest for the event the following day. Weren’t we surprised when the hotel personnel showed us to our room: a two-storey lower penthouse complete with a kitchen, a comfy common area, a spacious dining room, and with three bedrooms each having its own toilet and bath! My jaw dropped at the grandiosity of it, for honestly, both Joey and I are middle-class working people not that used to luxury. And there we were in a penthouse with two floors! Wow! Thank you, Jeyme and Vivere Hotel for this treat!! As Joey excitedly went up to the second floor to see what’s in there and I signed all the necessary check-in documents, he immediately called his two best buds Chris and Paulo and their wives Nicole and Rachel to see if they wanted to stay there with us. They were - and it was an impromptu staycation! Saya! But really, the moment I stepped into the penthouse, even as I was soothed by the calm lounge music at the ground floor, I immediately felt relaxed. Guess I’m really getting old because staying in and doing nothing and channel-surfing in a super comfortable hotel bed even for just a night was the stuff of dreams for me already, hehe! The next morning, being an early riser (or being woken up early by Lilibubs to eat, hehe) I had breakfast all by myself at the top floor. The solitude was nice, the view beautiful, the air crisp - it was a good energy starter to a packed day. By 7:30am I was ready to be made up; Jeyme asked a few days’ prior if the partner videographer, Lemon Three Films could shoot Joey and I for a “digital memories” film at 9am, and that the photographer, Happy Folks Studio, also requested if they could shoot a few pictures at 10:30am. The shower was scheduled from 11am to 3pm. The shoot was a breeze. It was our first time working with Lemon Three Films and Happy Folks Manila, and they made the shoot easy, not requiring many shots or poses, haha. Though of course, Joey was a bit awkward (the last time he was asked to look into my eyes was during our prenup shoot January 2015, hehe! 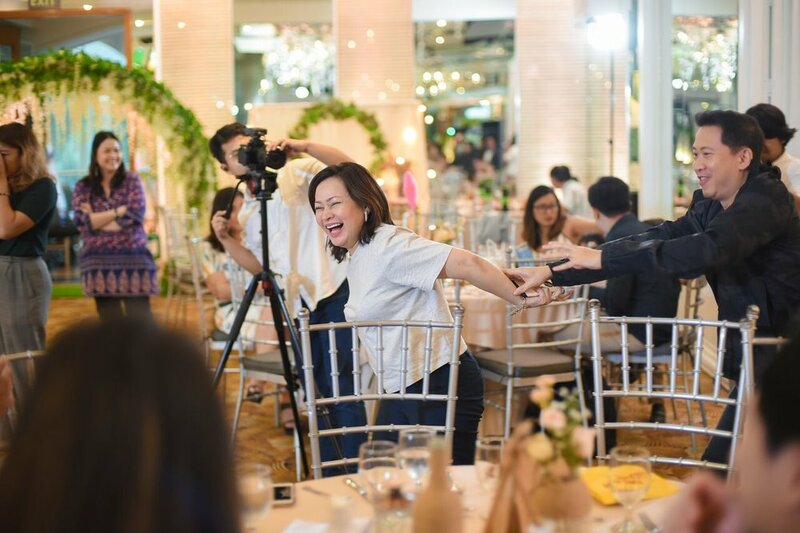 ), but everyone was cool and having good friends Arianne Antonio and Carla Avanceña doing hair and makeup for me added laughter to the morning. By about 11:30am, Jeyme called me saying that our first guests have arrived - my good friend Princess Velasco-Rosario with her panganay, Kobe. And so we proceeded to head down to the second floor ballroom. And what a lovely sight greeted us! An arch of leaves and white flowers adorned the entrance (beautiful styling, DM Events!! ), by its side was a very charming spread of dessert (Boulangerie 22), the tables were all rustically set with succulents and brown bottles and small lamps, the stage wowed with a huge garland and a teepee with a wooden pallet as backdrop, glass bubbles and branches hung from the ceiling, THERE WAS SO MUCH BABY COMPANY AND CETAPHIL AND PIGEON BABY STUFF at each side of the stage!! And when I looked to my left, there was a kid’s area with the stuff of kids’ dreams: COTTON CANDY (Lollipuffs), ICE CREAM (Baskin-Robbins) and two colourful tables with giant blocks and other toys in the middle (amazing setup by Party Kids Station). Clap, clap, clap for the amazing styling, DM Events!! 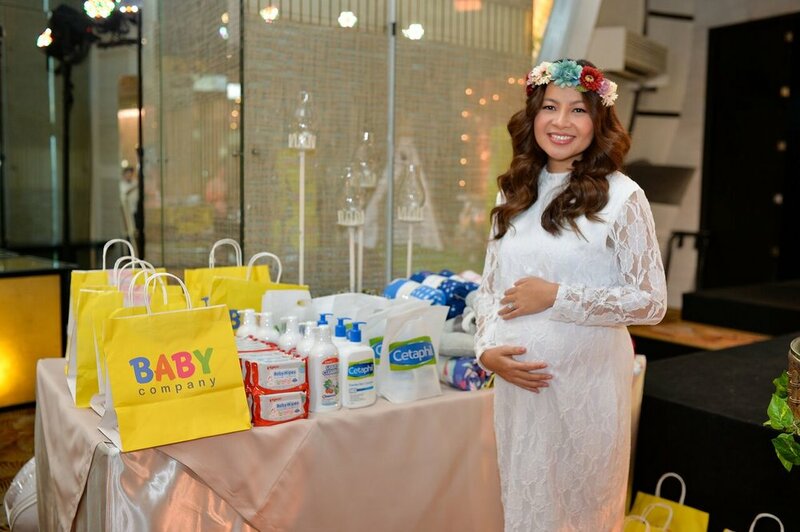 Posing by these Baby Company, Pigeon Baby, and Cetaphil products which turned out to be prizes for the games! Our guests were so happy! If I were a kid I would have headed straight here, too!! Great job, Party Kids Station!! Then of course, the BUFFET! Vegetable fritters (yummy okoy which I feasted on for days after, hehe! ), fruity salad with honey patis dressing, pork hamonado, medallion of beef in steak sauce, crispy fried pork spareribs (which Joey absolutely LOVED), chicken ala pobre, oven baked fish fillet with cashew nuts, sautéed tofu with bitter melon, chorizo pasta (super yum!!! ), turon, leche flan and really fresh fruits! Everything looked and tasted so good!! Our friends Patrick and Patty Filart enjoying the spread. Enumerating the dishes now and remembering the two scoops of ice cream I had - I want to go back to September 2 and eat and eat again, haha! May ganito pala! Amazing, Lollipuffs! OMG. 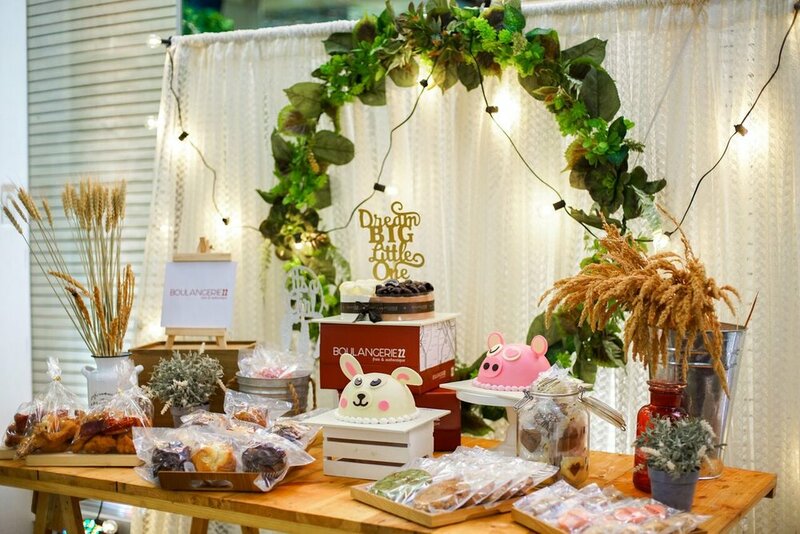 Sobrang bongga ng baby shower namin. Hindi namin talaga akalain!! Joey and I kept exchanging bewildered looks and I kept thanking Jeyme!! We started off the afternoon with of course, lunch (I must have went back to the buffet station three times! The food was so good!). Thanks also to our good friend, Pastor Brian Sebastian, for leading us in prayer (biglaan! Hehe!). Our host was Vanna Rodrigo Reyes. 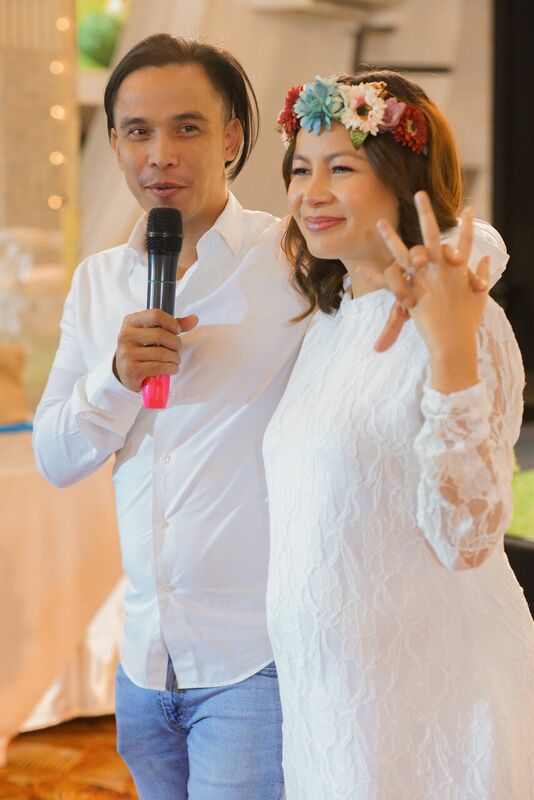 It was my second time to work with her but the first to have her lead our own party, and she had Joey and me and the rest of our guests laughing the entire afternoon with her well-timed quips! She was so funny and the perfect baby shower host! Tuwang-tuwa sa kanya si Joey! Highly recommended! We started the program by sharing our Lilibubs’ name: Issiah Dañelle B. Ramirez (pronounced I-si-yah Da-nye-le). When I woke up, the name of the prophet Isaiah was on my mind. So when we found out we were expecting a girl, I knew we were going to name her Isaiah, or a variation thereof. It was Joey who chose the name Issiah. We also wanted to name her after my father-in-law, whose name is Dan. Hence, Dañelle. A slightly different Pinoy version of Danielle. So her name is like a mixture of Italian, Hebrew, and Filipino, with a Spanish surname, hahaha! But her nickname will still be Lilibubs because it has really stuck already :D.
The Montemayors showing us how it’s done! Uh.. medyo parang mahirap ata malimutan ang image na ito, hehe! We requested to have a picture with our few family and friends who made it that Sunday. Again, my heart was full knowing that our Lilibubs is surrounded by good people who have prayed for and will love and guide her. Navarro family <3 unfortunately, the Ramirezes couldn’t make it because they were in Europe to support my brother-in-law Jami’s UTMB race. I thought that was the end of the program, until Vanna mentioned a surprise. We turned to the TV screens and watched what Lemon Three Films prepared for us (Joey and me: “Aah, yun pala yung shinoot natin kanina” hahaha mga walang ka-muang-muang! ): an SDE! I didn’t know they did SDE’s at baby showers! Lemon Three Films asked me to write and record a letter for Lilibubs. In between shots of our shoot in the penthouse and the shower that was, I read my letter for our precious miracle. I cried at the end of the program as Joey and I thanked everyone. Hindi na napigilan, hehe. Thank you so so much once again, Jeyme of One Tree South Events, and to all the sponsors and your partners who gave us this day that we will always remember: a day to rejoice in how good the Lord is through the generosity of others. Joey and I will never, ever forget. I pray that you all will be able to make more future mommies and daddies happy, and that the Lord will repay you for your kindness.